On October 23, 2014, President Ilham Aliyev received the newly appointed Ambassador of the Republic of Serbia Neboysha Rodich. After reviewing the Guard of honor Ambassador Rodich handed his credentials to Ilham Aliyev, President of the Republic of Azerbaijan. 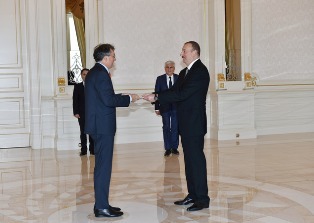 Afterwards, the Azerbaijani President had a conversation with the Ambassador. The parties expressed satisfaction with the current state of bilateral relations between Azerbaijan and Serbia, and noted that there was good potential for the expansion of cooperation in various areas.